Do you see holes or cracks in your chimney or masonry and need stone or brick pointing service? Brick pointing is necessary to repair eroding or crumbling mortar joints, correct defects, or to completely fill joints in newly laid masonry by placing mortar between joints in brickwork to improve water penetration resistance. Weathering and decay over time create voids in joints between masonry units allowing the undesirable penetration of water. Water entering through these voids causes significant damage to masonry from salt dissolution and deposition and freeze and thaw cycles. 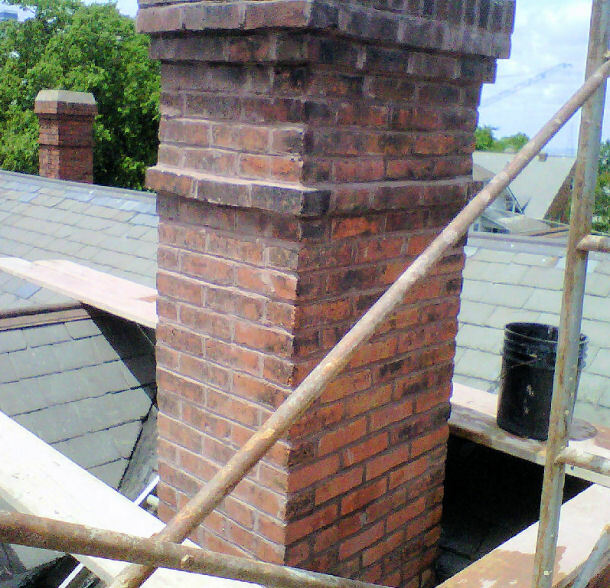 At Chimney Repair NY you will find qualified brick pointing craftsman who have years of commercial and residential experience successfully pointing bricks and mortar. We take great care to ensure all brick pointing projects are done properly without damaging the bricks or the non-decayed mortar. Request your Free Brick Pointing Estimate or call 1-877-952-7425 today to schedule service. Mortar joints typically last for about 25 years, but may vary depending on the type of mortar materials used and their exposure conditions. Chimney inspections should be scheduled annually to identify and repair any necessary mortar joint defects to ensure that the brick masonry is in good condition and that there are no faults. The most common means of water entry into brickwork is through cracked, debonded, or deteriorated mortar joints. Brick pointing deteriorated mortar joints is the most effective and permanent solution for decreasing water entry into brickwork. To prevent costlier chimney repairs call 1-877-952-7425 today for professional brick pointing service or request your Free Brick Pointing Quote.